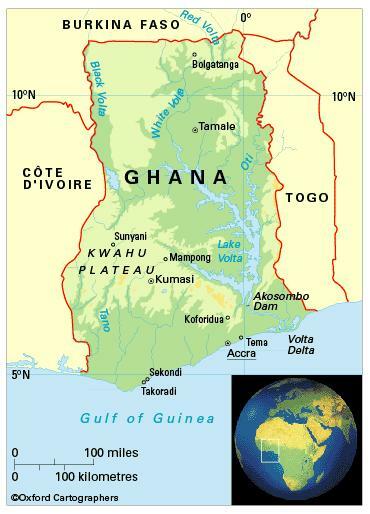 The Republic of Ghana, formerly the Gold Coast, is a West African country lying on the Gulf of Guinea. It is surrounded (clockwise, from the west) by Côte d’Ivoire, Burkina Faso and Togo. Ghana has ten regions: Greater Accra, Ashanti, Brong Ahafo, Central, Eastern, Northern, Upper East, Upper West, Volta and Western. After Greater Accra, Ashanti is the most populated region; Upper West, the least populated. Climate: Tropical; warm and fairly dry in northern areas, hot and humid on the coastal belt. Temperatures usually range between 21°C and 32°C. Annual rainfall varies from 700 mm to 2,150 mm. In 2007, large parts of West Africa were subject to severe flooding. Ghana was the worst hit with more than 300,000 people made homeless. poaching and habitat destruction threatening wildlife populations; and water pollution and inadequate supplies of drinking water. growth 2.5% p.a. 1990-2011; birth rate 31 per 1,000 people (47 in 1970); life expectancy 64 years (49 in 1970). Akan (45%) Mole-Dagbani (15%), Ewe (12%), Ga-Adangbe (7%), Guan (4%), Gurma (4%), Grusi (3%) (2000 census). There are very small minorities of other races. Economy: Ghana is classified as a lower-middle-income economy by the World Bank.